Known as the business city of Morocco, Casablanca is also a sun spot and perfect for a two day city break. Resolutely modern, with its buildings, thriving business districts, contemporary art galleries, fashionable restaurants and its brand new tramway, opened on 12.12.12 by King Mohammed VI, the white city has not however neglected any of its traditions and cultural heritage. 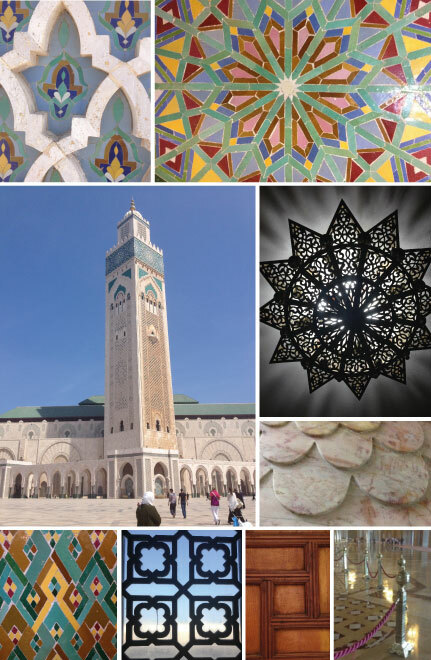 As evidenced by the new Hassan II mosque and the multitude of artisans who created and built – with their secular art – a monument facing the ocean and the sky, worthy of a thousand and one nights. Whilst staying at the brand new Sofitel Tour Blanche hotel, we sought the advice of Thomas Greggory, the young general manager of the hotel who moved to Casablanca a year and a half ago, and took a peek inside his city address book. Became legendary thanks to the film “Casablanca” directed by Michael Curtiz in 1942 with the legendary couple Humphrey Bogart and Ingrid Bergman. Celebrities such as Jean Charles de Castelbajac, Gad Elmaleh, Martine Sitbon and Alain Souchon are native to this city. The Sofitel Tour Blanche – the new flagship hotel of the So de Sofitel range open since July 2012 – is perfect for a Moroccan city break. At this built-to-purpose establishment, designed by the studio of Marc Hertrich and Nicolas Adnet, the term “comfortable” comes up frequently on the lips. The MyBed beds in all rooms, the spacious spa, open bar, cozy lobby and varied choice of restaurants – the whole hotel is dedicated to the idea of comfort, highlighted by the work of these two French architects. The effect of the materials, the style, the interest in well-executed details, the rooms in public spaces, punctuated here and there with bright colors – Nicolas Adnet has infused his art of French living into the work of local artisans. The interior designer created strong links with the traditional style to evolve the realization, while still respecting their craftsmanship. The Tadelakt walls were reworked to give them a silky, powdery appearance, the latticework follows the idea of seeing without being seen but is made from modern canopy, and the famous zellij have been finely cut like couture gowns to create a series of delicate patterns. Pleasant surprises were born of this cross-persepctive that successfully illustrates the spirit of the studio which is defined as “a manufacturer of interior architecture.” Their aim was to preserve the craftsmanship they came into contact with and to respect the environment in which they were building the hotel, all whilst infusing it with their own DNA. Suites, rooms and terraces strung together in a white tower, inspired by the Art Deco style of the city and created by Patrick Genard. The tower is one of the highest in the city after the Twins by Ricardo Bofill. And soon the penthouse will unveil its terrace and its new suite with changeable spaces to accommodate brunches and exclusive soirees all whilst contemplating the city. Built partly on the sea, the Hassan II mosque combines three elements beneficial to life: water, air and earth, with a roof that can open in five minutes. The third largest mosque in the world, it is also the tallest religious edifice with its 210 feet high minaret. Built between 1986 and 1993 by the French company Bouygues, it covers nine hectares and required 50 million hours by 35,000 workers and can accommodate 10,500 worshipers. Fountains and marble vanities, cedar wood and plaster sculptures, chandeliers, wall zellij and tadelakt were made by craftsmen recruited from all the cities of the kingdom. All of Moroccan craftsmanship is represented in this masterpiece that has managed to combine tradition and modernity. Aluminium tiles replaced the traditional terracotta of Fez to make the materials 65% lighter. The frame is seismic and foundations have been designed to withstand the effects of the swell. 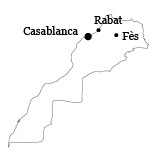 A laser beam with a 30 km range indicates the direction of Mecca for this monument that represents Casablanca. It is imperative that one takes a seat on the terrace of Cabestan to turn toward the ocean and rock to the rhythm of the waves on the rocks and revel in the natural spectacle, taking in the awesome light. Relax, languid in a chair, with a glass of white wine in hand and enjoy the Mediterranean specialties such as the cut or catch of the day prepared by French chef Fabien Caboy, in order to feel 100% on vacation. 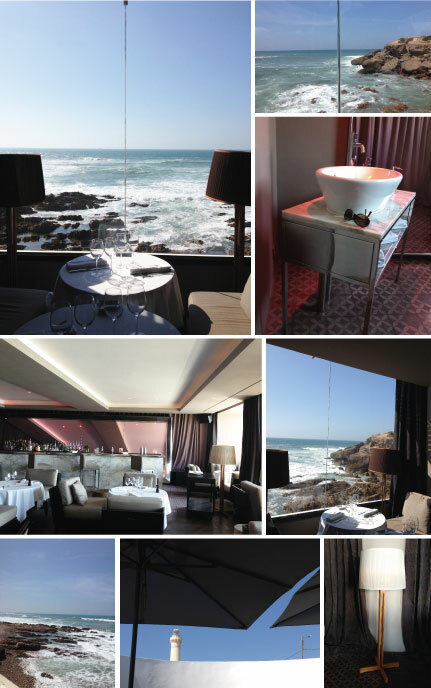 Established in 1927, Le Cabanon became Le Cabestan and has been revamped by architect and designer Imaad Rahmouni. The space is flooded with natural light through the large windows during the day, and the lights are dimmed at night to welcome fashionistas, artists, businessmen of the city and other international clientele. 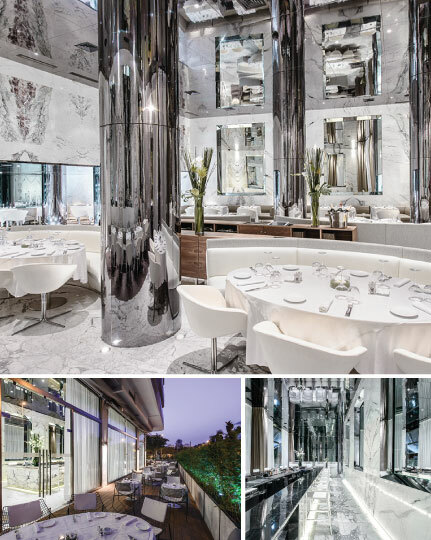 Carrara marble decor in pristine white and giant smoked mirrors spread over the ceiling and columns of this 600m² space by Christophe Pillet. This is the second Moroccan address of the eponymous Parisian restaurant, after Fez. We come here in the evening for a drink on the large central bar of the W Long Bar, and sample the cuisine of chef Thierry Vaissière who made his debut at Lucas Carton in Paris with Alain Senderens and Yannick Alléno, and then went onto La Tour d’Argent, finishing by obtaining two chef hats from the “Gault et Millau” Guide at the Sofitel Paris Le Faubourg. 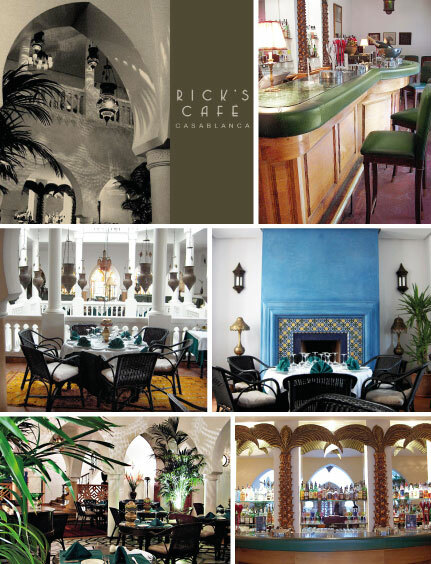 The gilded youth of Casablanca has made the restaurant trendy and Forbes named it as the best place for business meetings in 2007. At the corner of La Place Mohamed Abdou and La Rue du Commandant Lamy, facing the Parc de la Ligue Arave (on the Boulevard Zerktouni side). Fashion, accessories and furniture come together against a backdrop of woodwork painted and designed by Zora and Yassin. 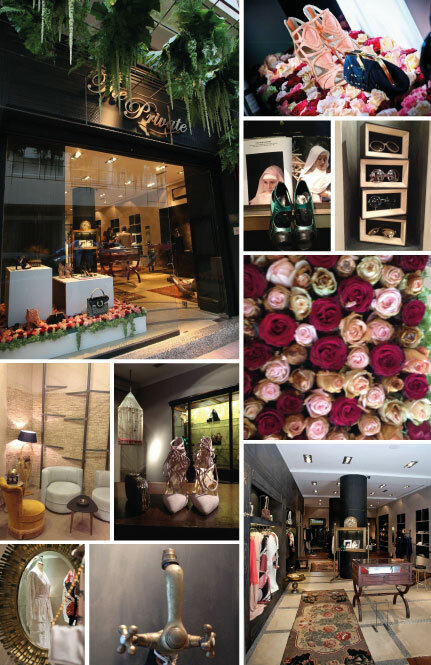 Their selection features pieces by Emilio Pucci, Hervé Léger, Léonard, Cesare Pacciotti and Moroccan designers like Amel Guessous. 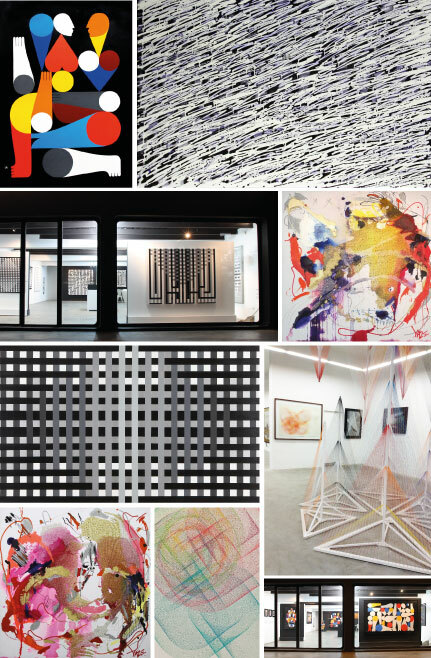 Founded in 2008 by Aisha Amor and Aziz Daki, the Atelier 21 Gallery is launching an annual cycle of exhibitions, dedicated to young talents offering them the exhibition space of the gallery. It also offers different services in terms of advice, from support in the acquisition of artworks to evaluation and expertise for already acquired works. The gallery represents, among others, the “installationnist” artist Fouad Bellamine, Mohammed El Baz, whose “burned heads” inflame the photographs, the photographer Majida Khattari whose series “Orientalismes” and “Luxe, désordre et volupté” pay tribute to the history of Western art, to the sensuality of works by Delacroix and even Manet, and to the female body. A special mention should be given to the work of Safaa Erruas whose symbolic works, stories of our time, such as “Le Tiroir”, are imbued with a certain poetry, fragility and a total absence of color to better “attract attention and communicate”. 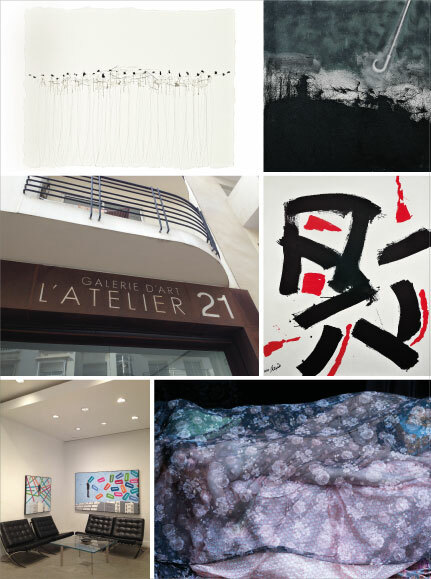 L’Atelier 21 Gallery exhibits “Figurations” by Meki Megara until June 7th. 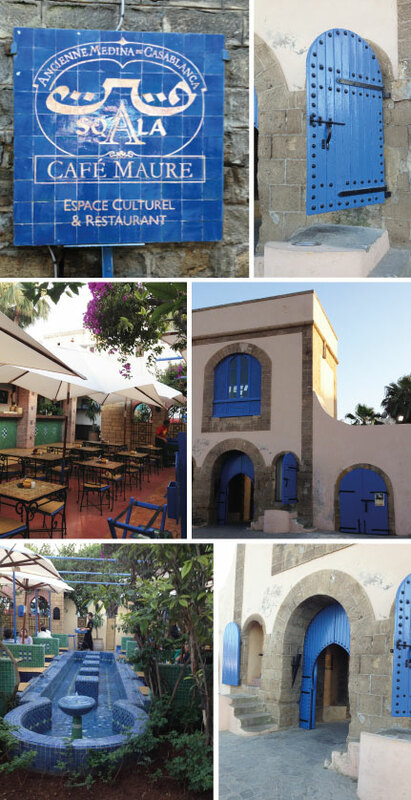 Drinking a cup of mint tea at “Café Maure” is an absolute must when in Casablanca, installed in the fortress of La Sqala, to understand and absorb the history of “Dar el Beida” – the White House in Arabic and “casa blanca” in Spanish. It was the Sultan Sidi Mohammed Ben Abdallah who took back Mazagnan from the Portuguese in 1769 to install the foundations of the White City. It takes its name from a tall whitewashed building and is identifiable by its vessels. La Sqala, a fortress with four kilometer long walls, was its bastion facing the sea. Then it was urbanized to enclose and protect the medina. Today families come to enjoy traditional dishes in the shade of palm trees with the sound of splashing fountains in the background. One can’t think about Casablanca without thinking about Michael Curtiz’s film that immortalized the city on the big screen and offered the public a story of espionage and romance during World War II with legendary couple, Humphrey Bogart and Ingrid Bergman. Kathy Kriger revived the myth by creating Rick’s Café in 2004, in an old house dating back from the ’30s, identical to the nightclub from the movie. The restaurant, bar and table games welcome nostalgic fans of the film in an atmosphere of old fashion charm that highlights the style of the time. Former U.S. diplomat Kathy Kriger says that “this is the project of her (my) life”, with the aim of preserving a certain architecture and sustaining interest in the city and its many facets. The black and white film plays on a loop in one of the rooms upstairs. You almost expect to surprise Humphrey Bogart and Ingrid Bergman kissing on the balcony. The piece designed by Jean Charles de Castelbajac is situated at the heart of the “Le Casart” bar in the Sofitel Tour Blanche. The designer pays tribute to his hometown by highlighting one of the replicas of the film by Michael Curtiz. 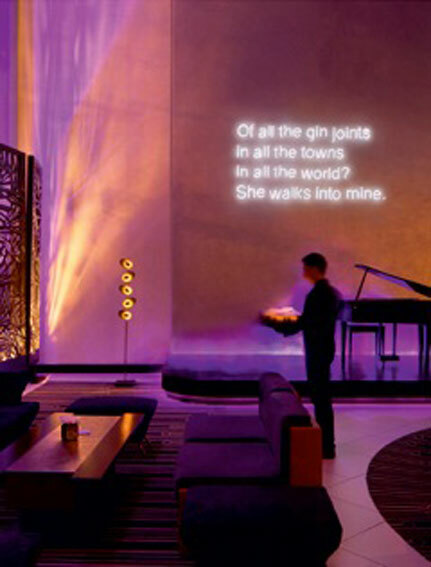 The bar that also hosts works by other artists from Casablanca has become an evening meeting spot with live music and DJ sets, while the cocktail menu is inspired by strong artistic themes such as Dadaism and Cubism to present 12 creations including the “Baroquain” mojito.